Posted December 8, 2006 in 2006/12, 6 Mainline, Assorted, Featured Work, Periods, Topic, z Archive. This is another selection made by a participant of my recent Featured Cover Contest as their favorite Simon and Kirby cover. I had provided an image of it before in my serial post The End of Simon and Kirby but it is such a great cover that it warrants repeating. When discussing Boys’ Ranch #4 (see my previous post) I said that all the covers for that title were so good that I would be hard pressed to pick my favorite. Well S&K did a good job on the Bullseye covers but there is no doubt in my mind that issue #5 is the best. In the origin story we learn that Bullseye got his name not just because of his skill with weapons but because of a target pattern that an Indian foe had branded onto his chest. All but one cover (#6) featured this target pattern prominently as part of the design of the cover. But for issue #5 S&K took it even further by turning the pattern into an Indian theme, as if it was some sort of flattened decorated teepee. Then added to this was one of the dramatic hand-to-hand combats that Jack had ever drawn. Clearly this unique cover is one of Simon and Kirby’s greatest masterpieces. 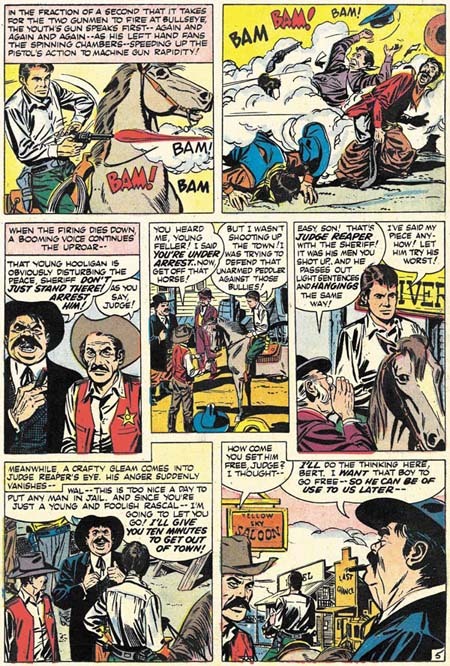 Boys’ Ranch and the Fighting American were probably the most obvious Simon and Kirby titles to reprint. But beyond a doubt Bullseye is a title that deserves the same honor. An interesting hero, great stories and lots of Kirby. Unfortunately it has not received the treatment that Marvel gave the other mentioned titles. But hey, I have not given up hope that some publisher will recognize what a classic Bullseye was. Posted November 29, 2006 in 2006/11, 6 Mainline, Assorted, Featured Work, Periods, Topic, z Archive. 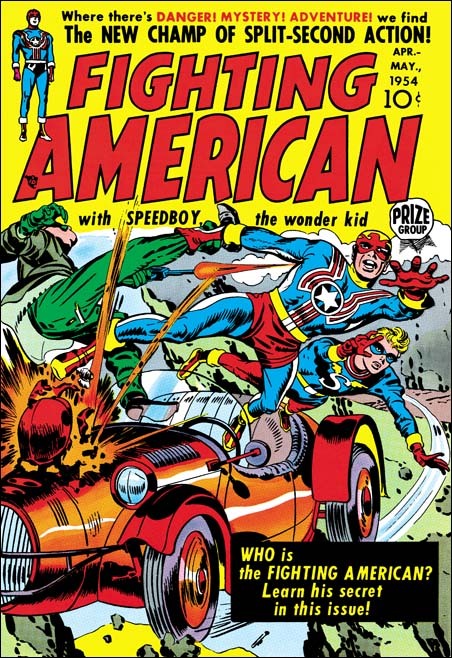 It is easy to see why one of the entries for my recent Best Simon and Kirby Cover contest was Fighting American #1. The cover shows a race car flying off a cliff. It that was not bad enough the engine is exploding. Fighting American and Speedboy leap to safety with Fighting American pulling along another man by his leg. Surprising the man shoots a gun at his would be rescuer. This scene takes up pretty much every inch of the cover below the comic title. I cannot see how Simon and Kirby could possibly have added more excitement to the cover. The art was done when, in my opinion, Joe and Jack were at their peak. Just look at the exaggerated perspective that Kirby uses, it is amazing. No doubt about it this is one great piece of cover art. Fighting American was obviously Joe and Jack showing how Captain America should be done. 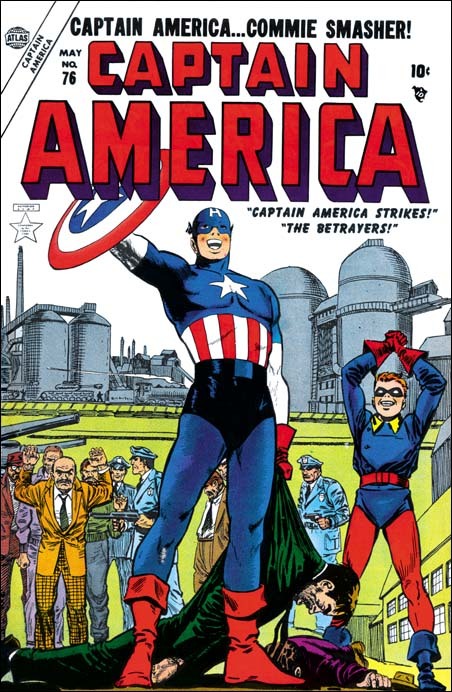 They had created Cap in 1941 but only did the first 10 issues, less then one year of work. Timely continued to produce Captain America without S&K up to issue #74 (October 1949) which was re-titled as Captain America Weird Tales. Timely must have known that they were about to end the title because the single Cap story showed the definitive end of their long time nemesis, the Red Skull. I say definitive because although the Red Skull had been shown supposedly killed before this time the story shows him in hell. There was a Captain America Weird Tales #75 (February 1950) but Cap did not actually appear on the cover or in any story. Coincidentally the demise of Timely’s patriotic hero marked the period of the rise of Joe McCarthy. McCarthy lead a crusade against all the communists that he said had infiltrated the U.S. government. McCarthy’s “investigations” can best be described as a modern day witch hunt. But that was not so obvious to Americans at the time as can be shown by the fact that a Gallup poll taken in January 1954 showed McCarthy had a 50% approval rating. 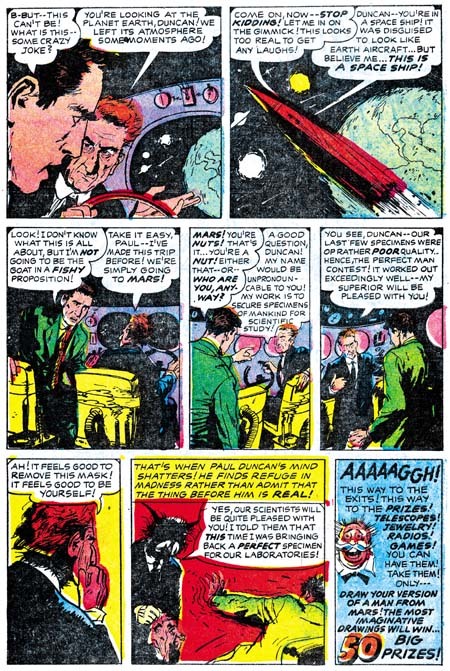 It is only a guess, but perhaps all of McCarthy’s talk about Communist infiltration brought back to the Atlas company thoughts of their previous success with their superheroes. After all if their hero line was was so financially successful fighting the Nazi’s during the war, perhaps it might occur again using the same heroes to fight the Communists. Whether that was thinking or not, Atlas re-launched the Human Torch, Sub-Mariner and Captain America in Young Men #24 (December 1953). It takes three to four months to produce a comic and so the earliest cover date following YM #24 appearance would be March or April 1954. April is exactly the date that appears on the cover of Fighting American #1. The timing is too perfect, could Joe and Jack saw that their old creation had reappeared? This could have prompted them to rush their own patriotic hero out hoping to take part in the superhero revival. But Joe McCarthy’s rise did not go unopposed. On March 8, 1954 Edward R. Murrow did a segment of “See It Now” critical of McCarthy and his tactics. On June 9 during one of his Senate investigation meetings Joseph Welch addressed McCarthy with the line “Have you sense of decency, sir, at long last?” On June 10 Senator Flanders introduced a resolution to condemn Joe McCarthy. On December 9 1954 the condemnation of McCarthy was passed by the Senate. At this point Joe McCarthy had been pretty much discarded on the rubbish pile of history where he belonged. I do not suggest that McCarthy’s downfall had any affect on the Atlas superhero revival attempt. No I think that the termination of this revival with Human Torch #38 (July 1954) can be blamed on the fact that they were really poor comics. (Sub-Mariner Comics continue until issue #41 dated October 1955 due to a hope of a movie deal). But although I do not think McCarthy’s fall affected Atlas much, it may have had an affect on Fighting American. That title had started out as exciting superhero fare but by issue #3 (August 1954) had turned to humor. The timing is just right for Joe and Jack to begin to see what McCarthy was really about and to change their comic accordingly. Before closing this post I would like to comment on the artist for the cover of Captain America #76 shown above. Both the GCD and AtlasTales attribute it to John Romita. John Romita did do a lot of the art for Captain America during this revival attempt. For instance he signed the covers for Captain America #77 and #78. Although unsigned, some of the art inside Cap #76 appears to be by Romita. But I find it hard to believe that John was the artist for the cover, Captain America just looks like he was done by a different hand. 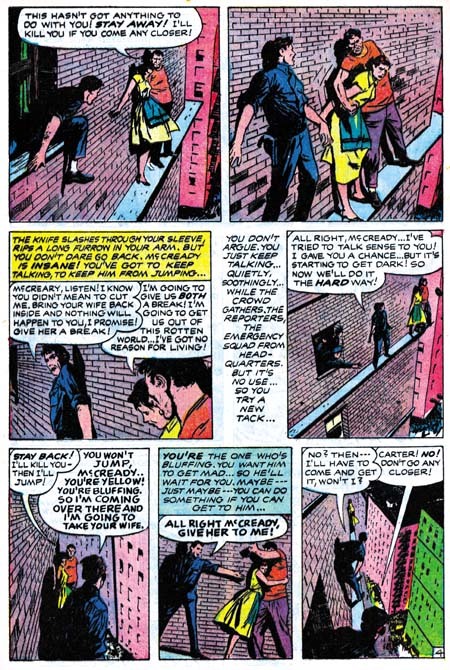 In an interview of John Romita by Roy Thomas from Alter Ego (volume 3 #9) both seem to indicate that they do not believe the cover for #76 was by Romita either. However the suggestion that John makes in the interview that it may have been done by Carl Burgos or Joe Maneely seems even less creditable. Unfortunately I do not know enough about Atlas artists to suggest an alternative. In the interview John mentions that Stan Lee often had art rework done by whatever artist had stopped by at the office at that time. John particularly suggests that Cap’s smile on issue #76 might be an example of that. But perhaps for Cap #76 the rework was much more extensive. Posted November 15, 2006 in 2006/11, 5 Studio, 6 Mainline, Assorted, Featured Work, Prize, Topic, z Archive. I come across lists all the time; the top 100 artists, the 100 most important comic books, and so on. All listed in a nicely hierarchy with one selected as the best. I do not know how people are able to make such lists. What criteria does one use to rank one artist as #100 and another as #101 (and so be excluded from the list)? Even the selection of the best can be wroth with difficulties. Should the best comic book artist be based on who did the best work or who had the most influence on the comic books of today? It should come as no surprise who I think is the artist that did the best comic book art. Subtle hint, look at the title of this blog. However if it is influence that counts then I might wonder if Will Eisner may be more appropriate. While not denying Jack Kirby’s tremendous influence on pretty much the entire history of comics, Eisner’s graphic novels launched a whole new genre, one that has even made it into the N.Y. Times Book Review. But even if I try to adopt a subjective viewpoint I do not find myself in an easier position. My favorite painting varies from day to day. My response to a piece of art depends as much as my mood as with the work of art. But ask me what my favorite Simon and Kirby cover is and most days I would say Treasure #10. This is a rather oddball cover for S&K. Treasure #10 comes not long after the failure of Stuntman and Boy Explorers. 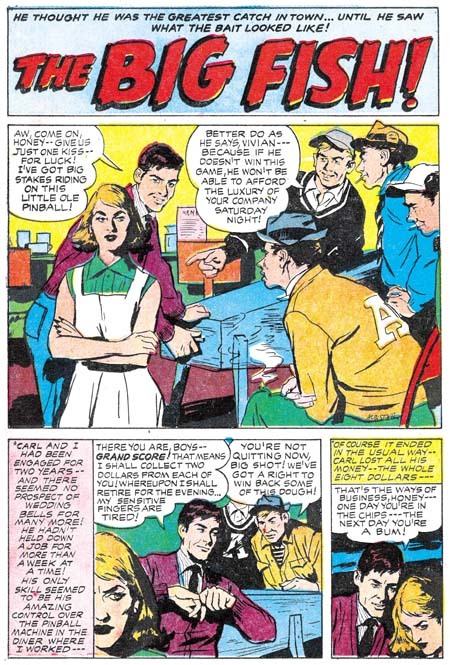 The publisher was Prize, Joe and Jack had done some work for them early in their career (Prize Comics #7, 8 and 9; December 1940 to February 1941). 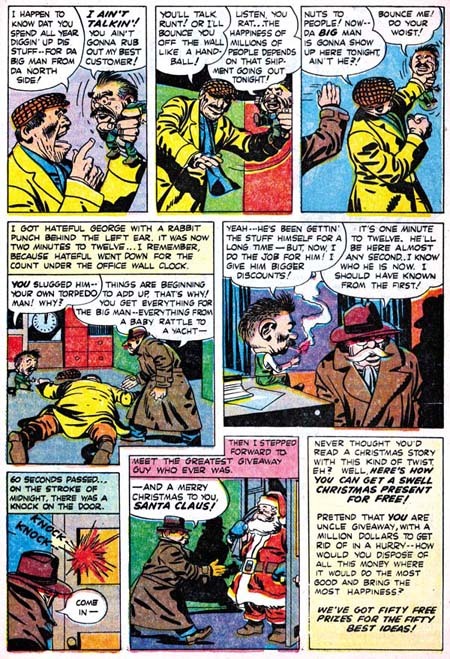 In March 1947 Simon and Kirby would launch for Prize the crime genre version of Headline Comics. Treasure #10 was used to introduce the new version of Headline. 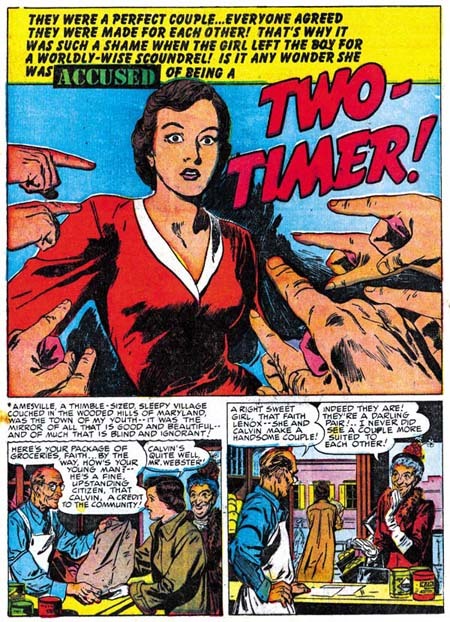 It includes a crime story (“Tomorrow’s Murder”), the earliest Simon and Kirby crime genre piece. There is an advertisement at the end of the story announcing the “bigger and better” Headline. It includes a copy for the cover for Headline #23. Both the ad and the illustrated comic indicate a January-February cover date. Headline #23 was actually cover dated March-April. Further the cover illustrated in the ad was really used for Headline #24. 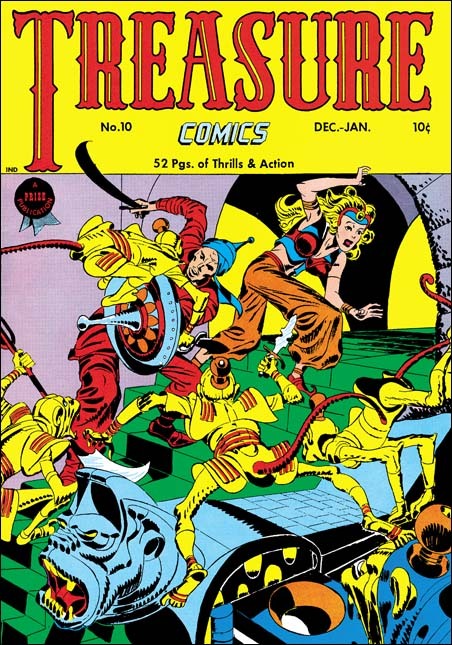 Treasure Comics appeared to once have an Arabian Knight feature, it is listed on the cover for Treasure #7. However there is no such feature, or anything like the cover, in TC #10. The GCD shows Treasure #6 and #7 covers (April and June) with an Arabian theme signed by H. C. Kiefer. I am not familiar with Kiefer’s work and it would be easy to dismiss him as a inferior artist compared to Jack Kirby. But such comparisons are really unfair and uninformative. The cover for TC #7 may be a bit crude and the demons looking more goofy then threatening. But TC #6 is a rather nice cover with lots of action and a good composition. Both TC #6 and #7 covers show shields with similarities with that used by Jack for TC #10. Further TC #7 adds an unusual point to the turban, a trait shared with TC #10. This suggests that Kirby used Kiefer’s covers as a jumping off point. What a cover Jack provides! An Arabian Knight seeks to escape with a beautiful princess. Well perhaps she may not really be a princess, but her exotic diadem suggest she is more then just a beautiful woman. The pair are faced with a swarm of adversaries intent on preventing their escape. Not your usual adversaries but a group of yellow bodied, red tailed monkeys. Not what you normally would think of as much of a challenge to our hero. But these monkeys are armed with exotic weapons and quite energetic in their attack. These are scary monkeys indeed. But not your normal scary monkeys, these wear exotic clothing and rather weird hats (how do those hats stay on?). Judging from the sculpted banister I would suspect there is a whole population of these monkeys that our desperate pair must somehow evade. Take a look at the monkey with the knife in the center of the picture, look carefully at his feet. The big toe is on the outside of the foot contrary to what is found in either monkeys or men. I used to think that this was done by Kirby on purpose to give them an even more exotic look. But during restoring the cover I noticed that the toe is on the correct side of the foot for the two monkeys on the left. So now I guess it is just another of those errors that Kirby is so famous for. Simon and Kirby did not do many of this sort of swashbuckler covers. Win A Prize #1 comes to mind as one other. (I wrote about the Win A Prize comic before during my serial post on The End of Simon and Kirby). But Jack was a master of action art and seemed to create such covers almost effortlessly. Posted September 15, 2006 in 2006/09, 5 Studio, 6 Mainline, Alternate Takes, Assorted, Periods, Prize, Topic, z Archive. In 1952 Marvin Stein provided a cover for Headline. I have not said much about Stein yet in this blog. For now let me say that a 1949 photograph from the Jack Kirby Collector #25 shows him in the S&K studio. Marvin’s work also shows up in some of the studio productions from around that time and it has been reported that he did inking work for S&K. It has also been said that he was a great admirer of Jack Kirby. 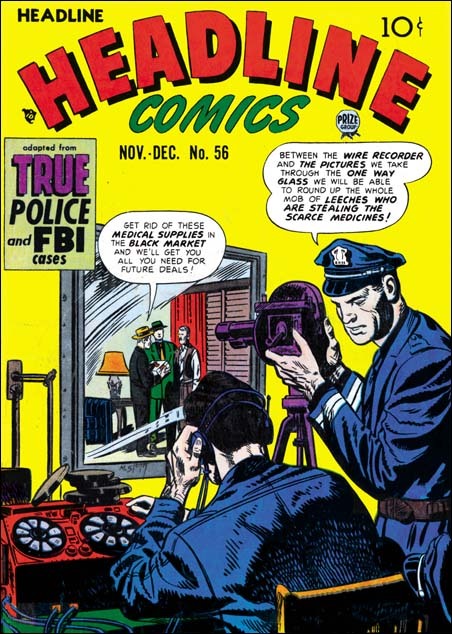 Initially the crime comics Headline and Justice Traps the Guilty were Simon and Kirby productions and they are listed as editors. Kirby drawn stories were frequent in these comics. All drawn covers (as opposed to the photographic covers) were done by Jack. Early in 1951 this changed. Nevin Fiddler was listed as the editor and Kirby no longer supply work for these crime titles. Marvin Stein now becomes a conspicuous artist for the crime titles. In fact Marvin draws just about all the covers and provides stories for most issues. A photo of the S&K studio of about 1951 or 1952 does not show Meskin. I conclude from all of this that S&K no longer produced the crime titles and that Marvin Stein was mostly providing work for the new editor, Nevin Fiddler. The Headline #56 covers is signed by Marvin Stein and is in his style so there can be little question that he was the artist. 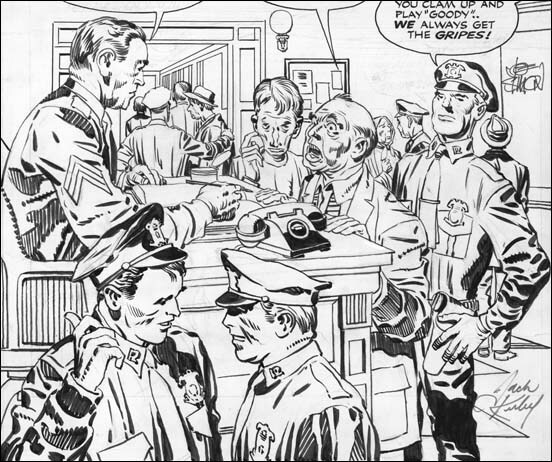 The inking on the policeman whose back is turned to the viewer is reminiscent of S&K studio inking. But the rest of the cover’s inking is not particularly like that done by S&K shop. Nor does the composition seem very like covers produced by Simon and Kirby. 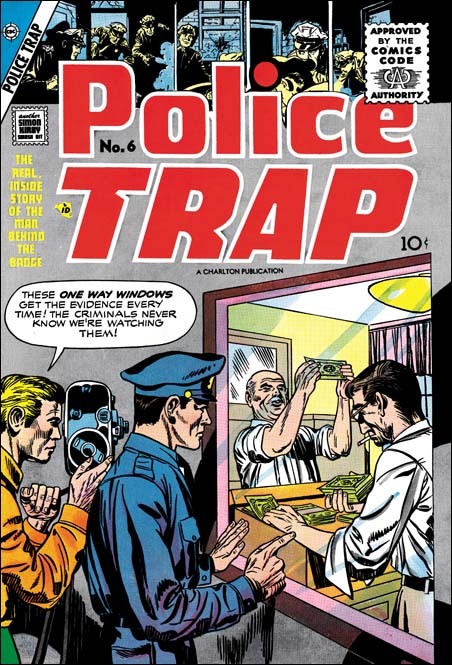 The subject of the police using a one-way mirror to trap criminals is, as far as I know, pretty unique for crime comics of the time. The cover does not correspond to any of the interior stories. 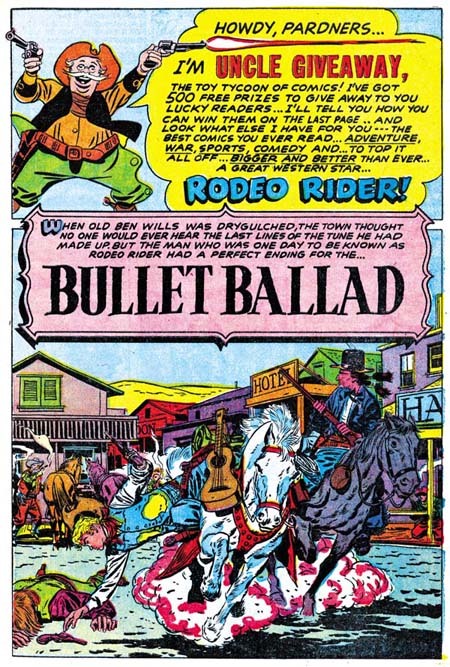 In late 1955 Charlton would publish the final issues of titles originally done by Mainline, Simon and Kirby’s own short lived publication company. 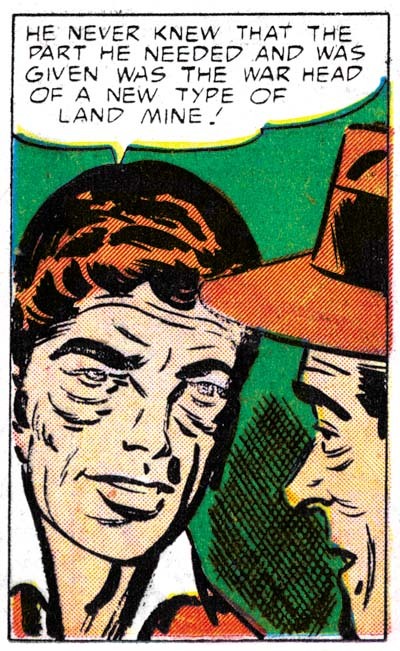 One of them, Police Tray #6, appears to be a swipe from the Headline #56 cover by Stein. Police Trap #6 was one of Jack’s poorer efforts but he still seems responsible for the pencils. The inking has signs of S&K shop inking, particularly the abstract arc shadows. Hopefully by now most Kirby fans realize that Jack would swipe from time to time. His sources for the swipes were generally from photographs, paintings or illustrations. At this point in his career it was unusual for him to swipe from other comic book artists particularly from someone like Marvin Stein. Police Trap #6 only shares the unusually concept with Headline #56. The composition differs in important ways between the two, mostly due Jack’s policemen being given less of the cover and his criminals brought much more forward. Still it is surprising that Jack would the same unusual subject. I see no reason to “defend Kirby’s honor”. Unlike some, I have no problems with swiping, as long as the swiper creates something with his own individual touch. It could be said that Jack has certainly done that with Police Trap #6. While not denying the possibility that this is another example of a Kirby swipe, I would like to offer another possible scenario. The covers published by Mainline seem much better then when the titles were done by Charlton. For whatever reasons S&K did not seem to put into the Charlton issues the same effort that they had previously done. If they were trying to do a rush job or cut corners it is very possible that they might turned to previously unused material. Perhaps the PT #6 cover might originally been made for Headline or Guilty but abandoned then because it was not quite good enough. It that is true then Marvin Stein could easily have seen it when he was working in the studio and used the idea a few years later. 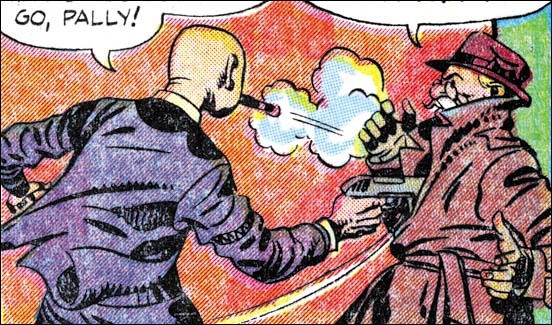 It would not be the only Stein swipe from Kirby. This is just a thought and I am not convinced one way or the other. Posted May 18, 2006 in 2006/05, 6 Mainline, Assorted, In Love, Periods, Serial Posts, z Archive. 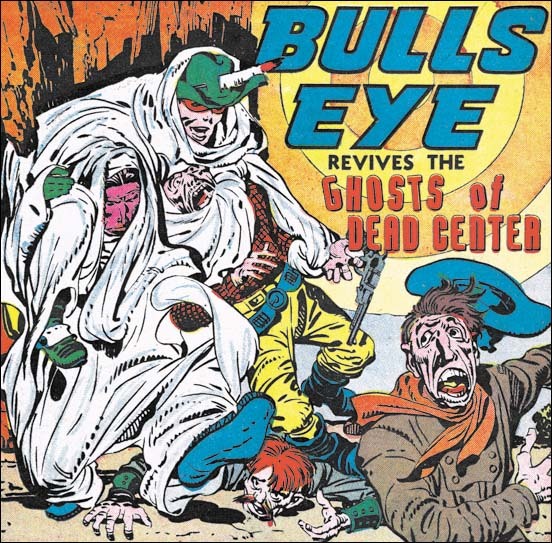 Bullseye #5 (April 1955) by Jack Kirby. It and Foxhole #4 were the last Mainline comics. Previously in the end of Simon and Kirby I discussed the rise of anti-comic book sentiments and the ill timed launched of S&K’s Mainline comics. A number of publishers seemed to be having problems, including Prize for which Simon and Kirby produced some titles. In the end Mailine failed with the last comics dated April 1955. 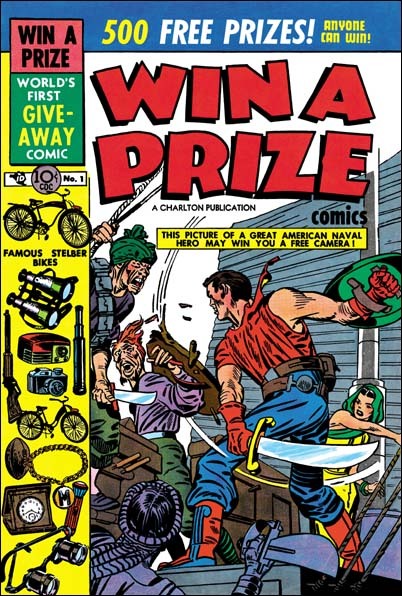 Two months before the last Mainline comic, Joe and Jack launched a new title Win A Prize published by Charlton. Charlton was notorious for their low page rates. There can be a couple of explanations for this choice of publisher. One explanation is that part of the idea behind Win A Prize was the giving away of prizes. The cover announces “500 free prizes, anyone can win”, and Joe Simon insists that they really did give away prizes. For a small company like Mainline this could be a problem. Not only the cost of the merchandise but the logistics of sending the prizes to the winners. But Charlton had a vertical company structure, they did everything from producing the comics, printing them and doing the distribution. They probably were the ideal outfit to handle this sort of thing. Well except for the problem of being cheap. 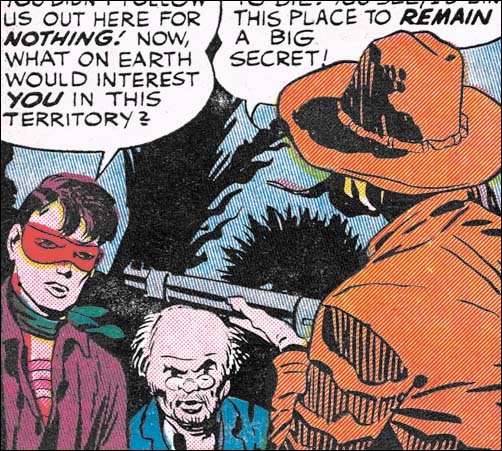 The second explanation for making a deal with Charlton to publish Win A Prize is that Joe and Jack might have already known that Mainline was in trouble. With decrease profits from the comics they produced for Prize, S&K may not have had enough cash to finance the launch of another title. The Mainline comics were distributed by Leader News and that company may already have seem like a poor choice. 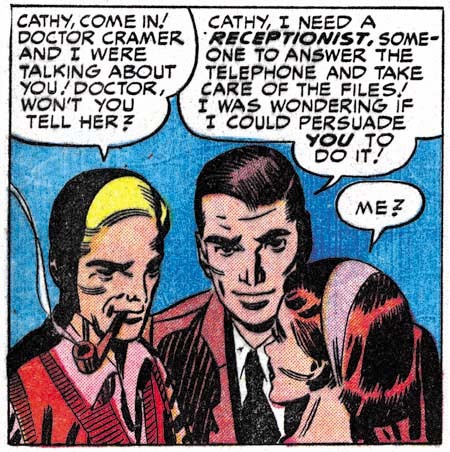 Charlton may not have paid much, but Simon and Kirby may have been desperate at this point. Win A Prize was unique for Simon and Kirby. They had produced anthologies before but they were always genre specific. They did crime, horror and romance, but Win A Prize with just a general anthology. That sort of thing was common during the war, but I suspect it was unusual in the mid 50’s. Here is a rundown of the stories to show the sort of mix it was. They are all relative short stories, the longest is 7 pages. We have seen Bill Draut before, but also included is Joe Albistur. 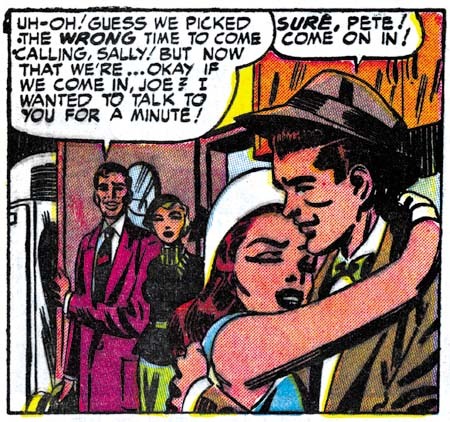 Joe was a relatively recent artist to work for S&K, he first appeared in Police Trap #1 (September 1954). 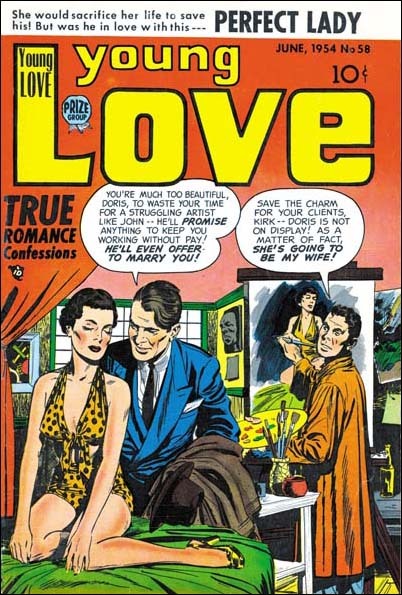 He also did a number of romance stories taking up some of the slack left by Kirby then absent from the Prize romances. All the Win A Prize stories are really nice and I promise to highlight some of them in the future. Although I rather like Win A Prize, it did not last long, ending with issue #2 in April 1955, the same month that Mainline ended. The “hook” really wasn’t the contents, it was the prizes. With all the logistical problems these prizes brought I am sure Charlton wanted to see really good sales really quick. When they failed to materialize, the title was cancelled. 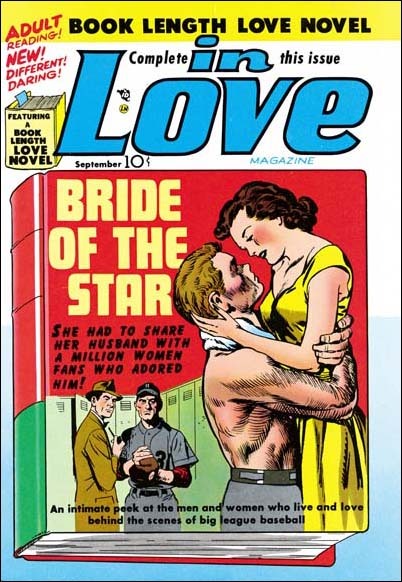 In May 1955, one month after the last Mainline comics, In Love #5 would be published by Charlton. Charlton would soon print the rest of the former Mainline titles; Bullseye, Police Trap and Foxhole. But these former Mainline comics would only last a couple of issue each, the last (Police Trap #6) is dated September. But their termination may not have just been due to poor sales. I think the these Charlton issues were made using material already completed or in progress when Mainline abruptly ended. It would be better for S&K that they get low payment for this artwork from Charlton, then get nothing at all. 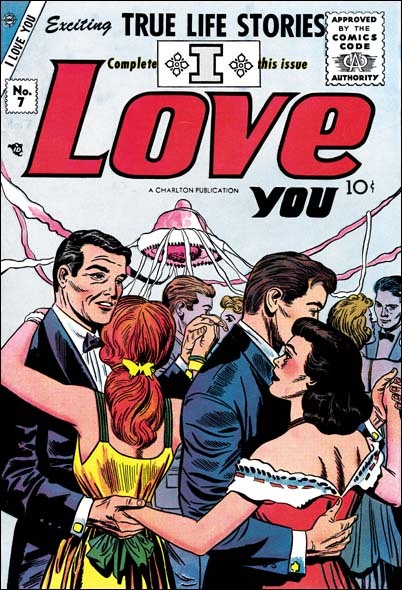 In September Charlton would change the title of “In Love” to “I Love You”. I Love You #7 has a (rather weak) Kirby cover but the contents do not look like they were produced by Simon and Kirby. I think Charlton was just reusing the volume number, a not uncommon technique to save postal registration fees. Charlton probably assembled the contents and Simon and Kirby only supplied the cover. 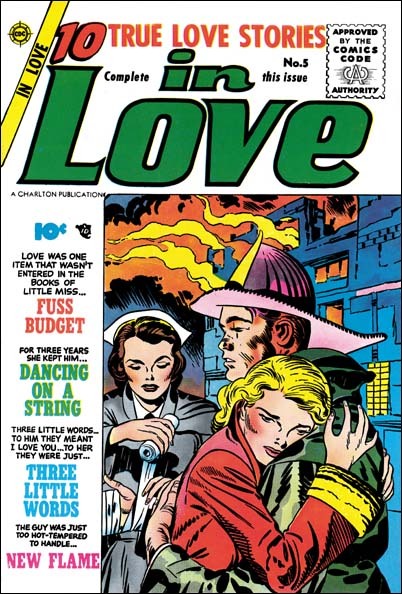 I Love You turned out to have a run of 115 issues for Charlton ending in December 1976. 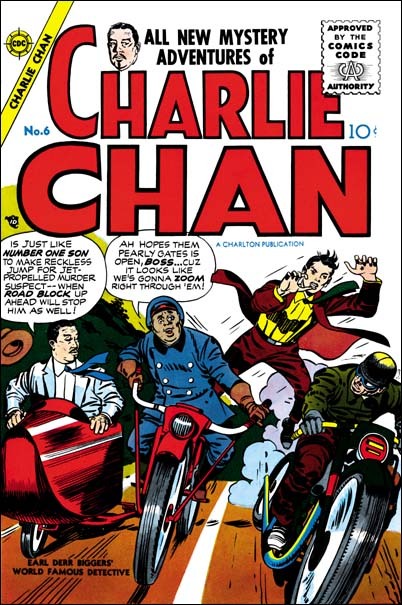 At the same time as Charlton was publishing the remnants of the Mainline comics, they also started to publish Charlie Chan. This was a title that Simon and Kirby originally produced for Prize. Under Prize Charlie Chan lasted 5 issues with the last one dated February 1949. 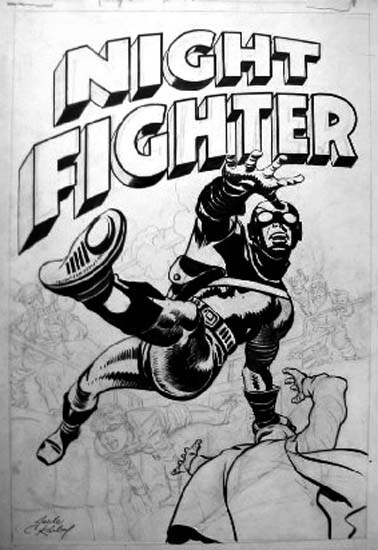 In the original series Jack Kirby penciled all the covers but did not do any of the contents. In the first Charlton issue we again find Jack providing the cover but none of the contents. But I don’t believe that this cover is just unused material from the Prize run. First the inking style is more like the late shop style then what was used during the Prize version of Charlie Chan. Second, originally the Charlie Chan covers were static with the “number one son” getting ready to spring into action. On the Charlton cover the son is in the middle of jumping from one motorcycle to another. This sort of emphasis on action is more in tune with later Simon and Kirby covers. And lastly #6 cover includes Burmingham Brown. 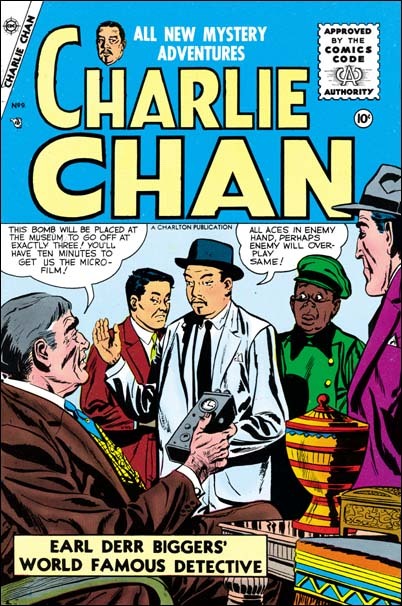 This stereotype sidekick did not appear on the Prize covers or contents but would appear on the cover to Charlie Chan #7 and #9. 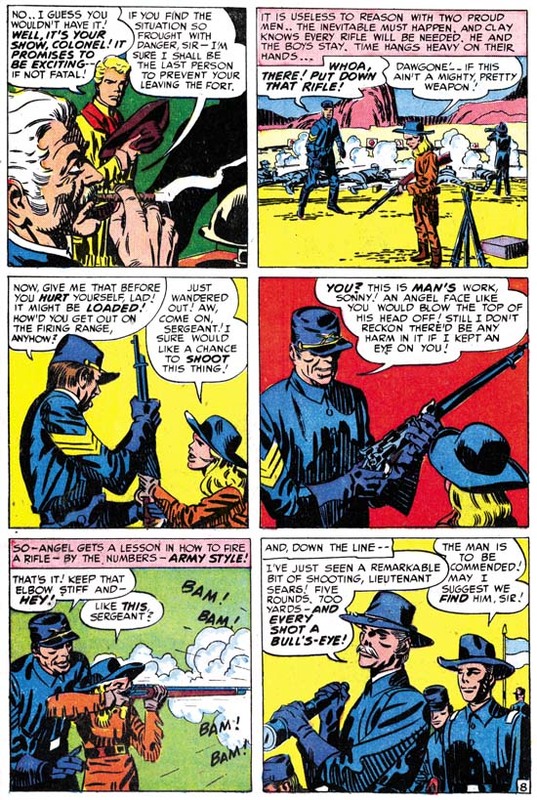 Although Kirby did not do any other pencils for the Charlton Charlie Chan, Simon and Kirby did produce those comics. Issue #7 has the stamp that announces “another Simon and Kirby smash hit” that was used on the late Mainline titles. 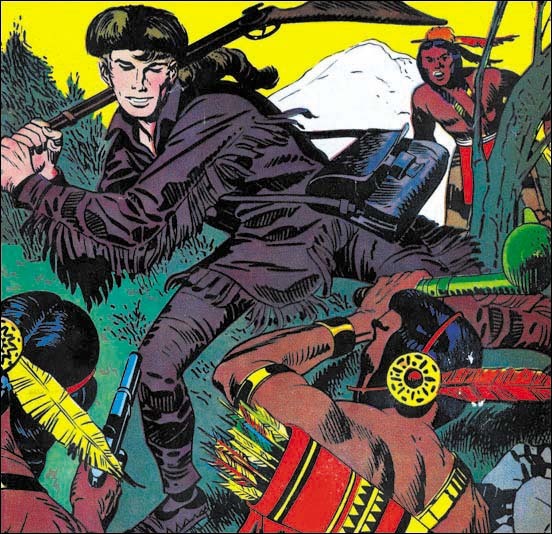 Joe Simon still has color proofs to all the Charlton covers. 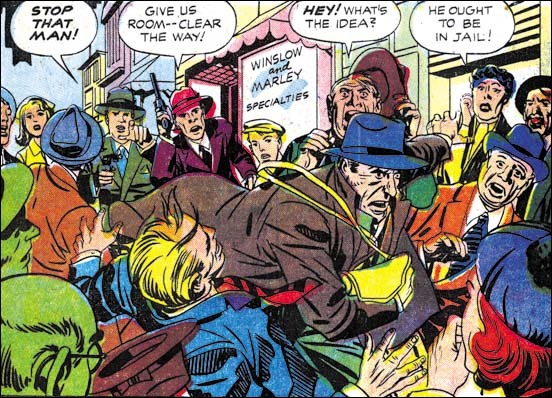 Charlie Chan is unique for Simon and Kirby’s work with Charlton in that it lasted a full 4 issues ending in March 1956. Regardless of whether they started with unused Prize artwork, clearly S&K also produced some new material for Charlton. Posted May 7, 2006 in 2006/05, 5 Studio, 6 Mainline, Artists, Assorted, In Love, Periods, Prentice, John, Prize, Prize, z Archive. John Prentice was the last of the usual suspects (artists that worked frequently for the S&K studio for an extended period of time). John served in the Navy during the war, in fact he was at Pearl Harbor when the Japanese attached. Afterwards he went to the Art Institute of Pittsburgh for a short time. 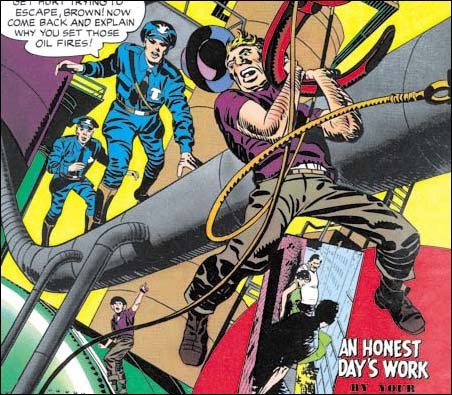 John arrived in New York in 1947 and the GCD shows him doing work for in Airboy Comics and Gang Buster. 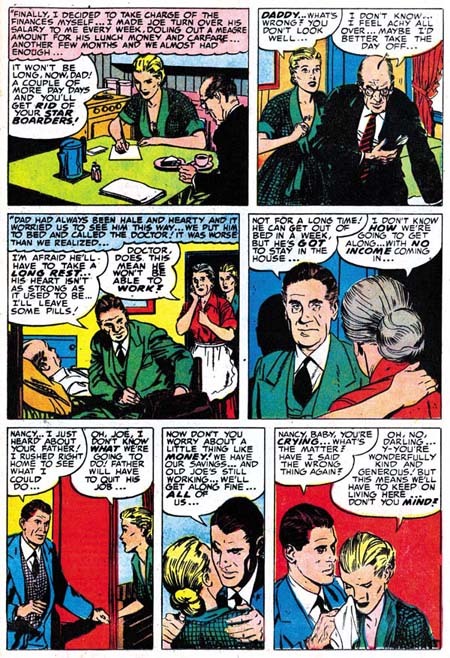 The first work he did for the Simon & Kirby studio was Young Love #4 (August 1949). Once John started with S&K he was a frequent artist for their productions. The work he initially did for S&K was pretty good, but John progressed fairly rapidly while until he achieved his mature style which really was exceptional. Joe and Jack must have thought highly of John’s work because he was an important contributor to Bullseye #1. 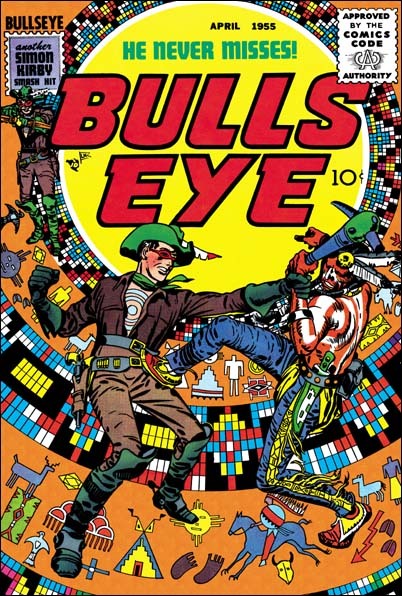 The Bullseye origin story was divided into three chapters (“The Boy”, “The Youth” and “The Man”). Jack did all of the first chapter and the splash pages for both of the other chapters, but Prentice penciled all the rest of the story for the last two chapters. 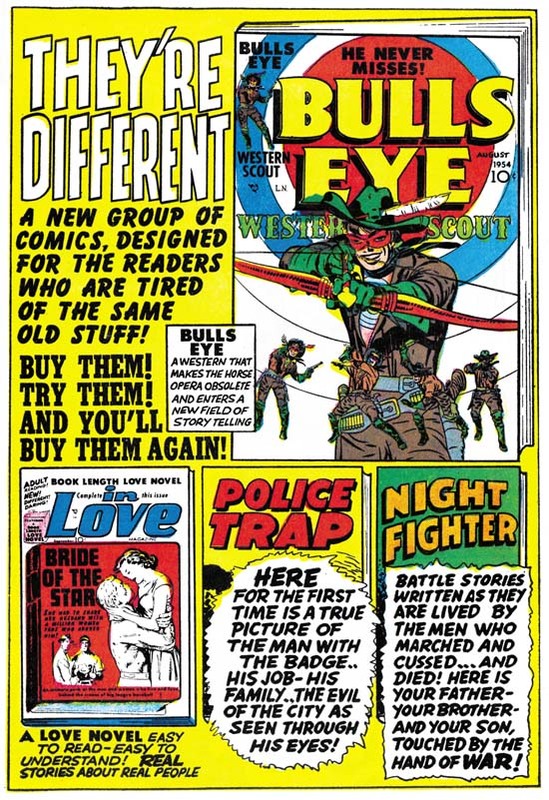 Bullseye was part of the Mainline comics, Simon and Kirby’s attempt at self publishing. But while doing Mainline S&K continued producing comics for Prize (Black Magic and the romance titles) during that time. Presumably because of his work load, Jack stopped penciling for these Prize productions. 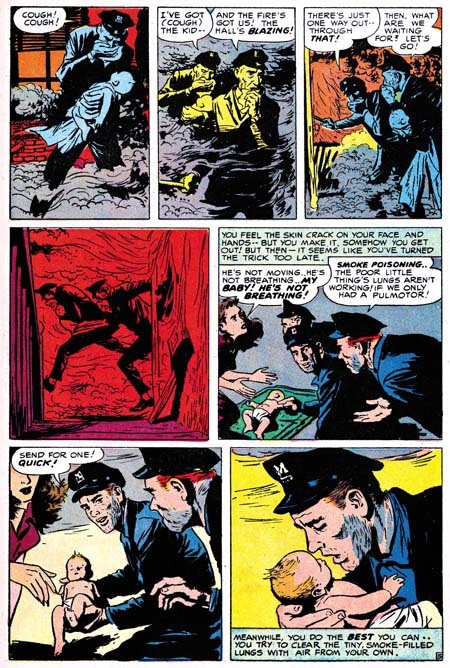 Prentice seems to have taken up some of the work for the absent Kirby because his page output jumps from an average of about 12 pages a month to about 26 during the period from March to October, the last month for Mainline comics. Bullseye #1, “Bullseye, The Youth” (August 1954). Like Bill Draut and Mort Meskin, John seemed to worked in all of the genre from the S&K shop. Romance genre were the most frequent stories produced by the studio and Prentice’s style was well suited for them. John was probably the most realistic artist to work for S&K. His men tend to have small eyes and long faces. John’s women are attractive, but are not what I would call glamorous, perhaps sophisticated would be a better description. For some reason Prentice never signed any of his work for Simon and Kirby. Attribution of this work to John is based on work done for the Rip Kirby strip (see below). Young Love #45, “I Like It Here” (May 1953). Simon and Kirby’s timing in starting their own comic publishing company, Mainline, was unfortunate because that was the period when anti-comic sediment swept the country fueled by Dr. Wertham and a Senate Investigation Committee. Many publishers felt the effects, but it was probably worst for new companies like Mainline. Mainline’s last comics were dated April 1955. John Prentice’s last work for S&K’s Prize publications was Young Love #69 February 1956. 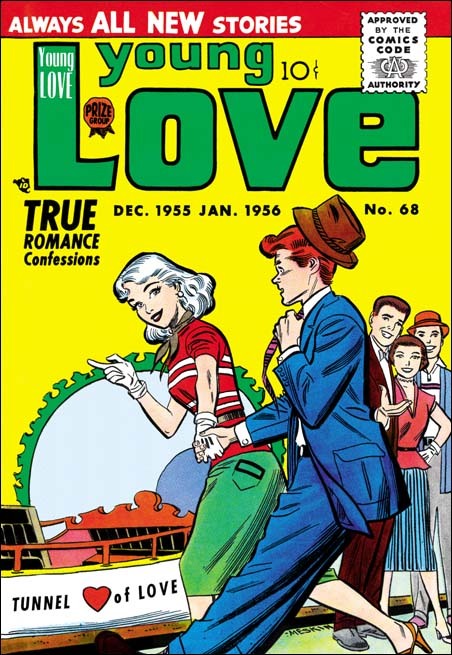 However Joe Simon did some editorial work for Harvey during this difficult period, and Prentice work there on romances until February 1957 (Hi-School Romance #60). If the GCD can be trusted, John returned to work for DC, mostly on their version of the horror genre. Young Love #58 (June 1954). I would like to repeat a cover that I posted earlier, In Love #1. This is one of the few covers that Kirby shared pencil duties with an artist other then Simon. The foreground couple are clearly Jack’s, but the background men were done by John Prentice. Ignoring covers with unrelated inserts, there was only one other cover that Jack shared with another penciler other then Joe during the S&K years. If you don’t know which cover I am talking about, don’t worry I’ll post it shortly. On September 6, 1956 Alex Raymond, the artist for the syndication strip Rip Kirby, died. Two months later Prentice took over this popular newspaper comic strip. John would do Rip Kirby until he in turned passed away in 1985. I’ve always heard how much work was involved in producing a comic strip for syndication. But the GCD continues to list comic book work by Prentice from 1957 on into the early 70’s. Well now I’ve managed to give a brief review on each of the usual suspects. But work by Draut, Meskin and Prentice is so common in S&K productions I am sure to be blogging on them from time to time. Although the usual suspects did a lot of work for the studio, there were other artists who would work for Joe and Jack for shorter periods of time. Many of these artists were quite talented, some later on would achieve fame. I’ll post on some of the other artists some other time.